It’s officially Spring, and now more than ever, little feet will be pitter-pattering in and outside your home. The weather is warm, your kids are excited to run free after a winter of being cooped up inside, and you’re concerned about their safety. One particular area of your home deserves extra attention when it comes to kid-proofing and safety tips: your garage door. Garage doors are heavy, bulky, and move quickly. Little hands and feet can easily get caught beneath a garage door or in the hinges if unsupervised. In addition, because the door is large and automated, children may view it as a toy and want to play with the remote control, or hang onto the door as it raises. However, such activities are dangerous and can quickly lead to serious injury. According to statistics provided by the Consumer Product Safety Commission, 40% of the safety systems built into all garage doors manufactured after 1993 failed to work properly in 2013, resulting in garage door reversals that came down with enough pressure and speed to crush a young child. Garage doors are not toys, and teaching children garage door safety should be one of your first priorities as a homeowner and a parent. Unsure how to protect your kiddos while operating your garage door on a daily basis? Never play, stand, or run near or under a garage door, whether it is closed, open, or moving. Openers are for use by adults only. Children should not be allowed to play with the wall button or remote control that opens the garage door. 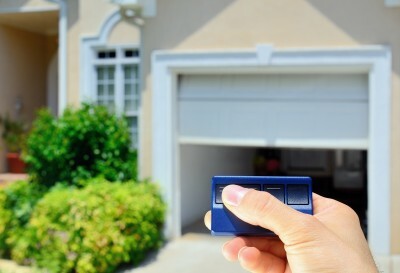 Make sure that your garage door opener button is installed at least five feet from the floor so it is completely out of reach of tiny fingers. Never touch any part of an opening or closing garage door. If the door is moving, it is off-limits. Keep keychain remote controls out of the hands of your kids. Discuss garage door safety regularly with your children, and be sure to share this information with the parents of your childrens’ friends so that, during play dates at your home, both your children and their friends play safely and appropriately. Garage door safety is one of the most important factors to consider when owning a home and raising children. By reviewing the above safety factors frequently with your kids and providing appropriate supervision, you can prevent injuries and promote a safety-positive environment for both your own family and guests. Have questions about garage door operation or safety? Call us! Our experts at Ponderosa Garage Doors are always happy to discuss your concerns.